I like to collect pieces of art which have meaning for me, and oftentimes that meaning is connected in some way to my spirituality. One of the reasons I became interested in the Pagan Path is because of its strong links to the Divine Feminine; its recognition of the Goddess and of the female presence in the universe. I come from a family of strong women – intelligent women, independent women, outspoken women… women who were born before their time. My Grandmother Beach, who was actually born in the late 1800’s and didn’t give birth to her only child (my father) until she was in her mid-40’s, actually received her high school diploma at a time when few young women even graduated from grade school, let alone attended high school. My mother received her degree in pathology and medical technology at a time when science was not so popular a college subject amongst women. My other grandmother owned her own shop for several years. I’m proud to have such women in my family tree. So naturally I tend to gravitate to artwork which celebrates women; which recognizes them for the strong, intelligent, beautiful human beings they are. 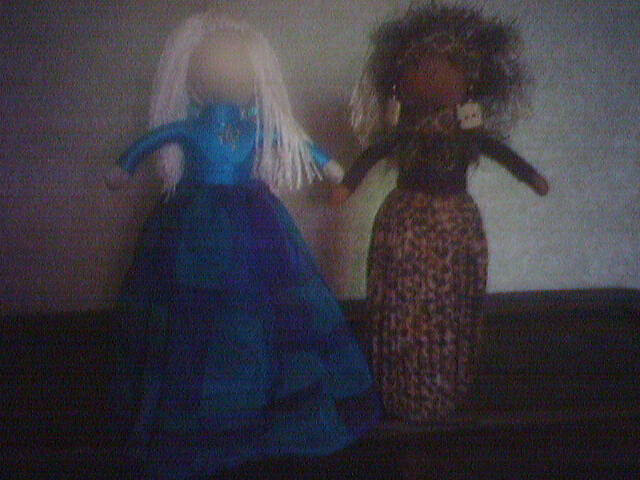 As you can see, these dolls are very different, but they each portray that strength and beauty in their own unique ways. The “Company of Women” dolls were created to raise the awareness of the contribution of women and are dedicated to the many nameless and faceless women who quietly provide for the enrichment of the people around them. The doll is the symbol of the strength, spirit, and the very essence of women everywhere. These dolls are one of a kind and represent women young and seasoned. They are the daughters, sisters, wives, mothers, grandmothers, and aunts from every diverse population. They are nameless and faceless and created to represent pride in being one’s self as a unique person of worth while being instrumental in nurturing families; and bringing laughter, faith, hope, consolation, encouragement, peace, pride, and joy! I love my dolls. They are very meaningful to me, and they both hold places of honor on my shelves, where they are displayed for everyone to see. One might wonder why I would be attracted to such a doll, but she truly spoke to me while I was trying to select one from amongst the several Deborah had for sale. She reminded me of an Amazonian Princess – standing tall and strong. Or perhaps an African Queen – proud of her heritage, displaying her regal beauty for all to admire. I’ve always been fascinated by different cultures and ethnicities, and perhaps that explains why I chose this doll over the others, even though they were all equally beautiful. As you can see, this doll is quite different… and yet she is beautiful in her own way. Again, she was chosen because she spoke to me. In this case, I was attracted to the fact that she reminded me of water – my favorite element, and the basis of my spiritual name. She makes me think of Yemaya, “Mother Ocean,” the Yoruban goddess of the sea. I love the colors in her skirt and her shimmering crystal blue earrings. These dolls serve to help me remember the many women who have come into my life over the years. Some I may know and perhaps even become good friends with; others might remain as faceless and as nameless as these dolls – but nevertheless, they have all made their impact on me. I honor them, and I celebrate them. And I thank them… for their strength, for their wisdom, for their beauty, for their love. For being the women they are. These are beautiful dolls, despite the less-than-ideal quality of the photographs. One can tell that Deborah put a lot of effort and creativity into making them. I think art should reflect not only the person who creates it, but the people who appreciate it. I think it’s clear that anyone who likes and collects these dolls would have strong sentiments about the beauty and spirituality of women.